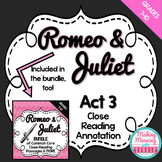 Romeo and Juliet: Act 3 Scene 1 - The Fight Scene! This is a quiz for Act 3. 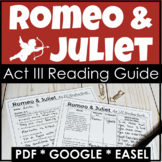 It involves general and specific questions for Act 1, both reading comprehension and literacy questions. It also involves vocabulary words for the upcoming Act, so students become familiar with otherwise unfamiliar words before they approach them. 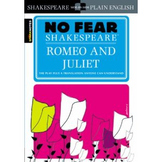 Students will think about the climax of the play and how it develops the central conflict. They will trace the conflicts the lead to and stem from the central conflict. 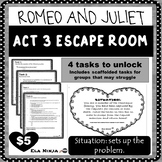 They will then answer a critical thinking question about Romeo’s role in conflict development. 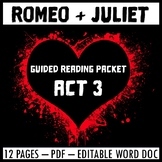 This is a pretty thorough study guide for Act III of Romeo & Juliet. Some questions are my own, others are taken from our Common Core aligned text book. It includes comprehension questions and"thinking" questions, as well as quote identification and translation.